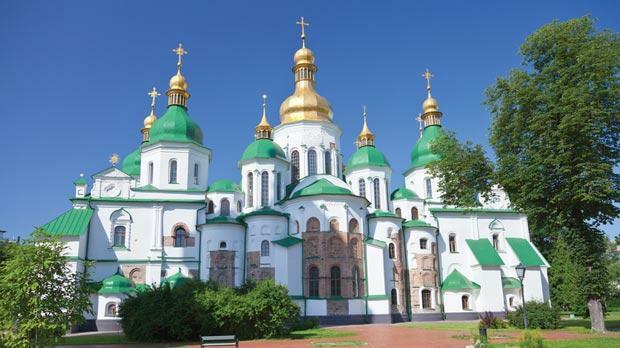 St Sophia Cathedral’s green and gold facade boasts of Kiev’s riches. 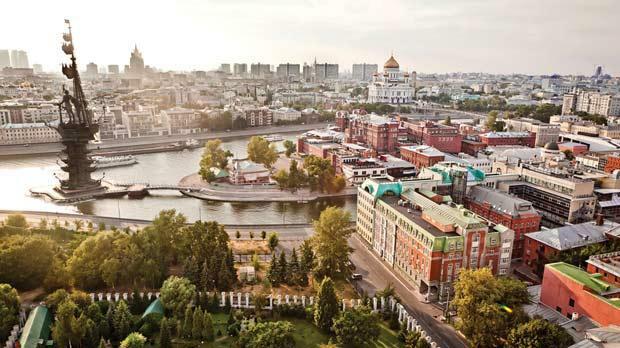 A panoramic aerial view of the Russian capital. 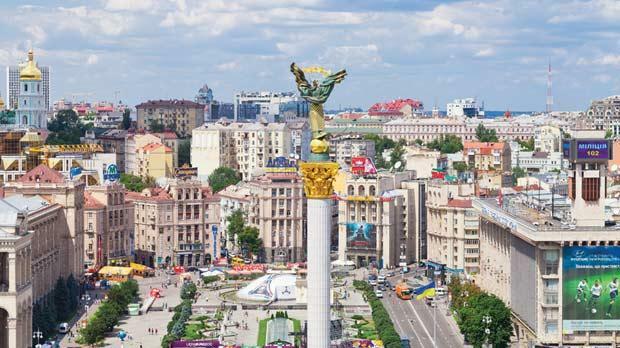 Maidan Nezalezhnosti square was the centre point of celebrations for independence in 1991. Komsomolskaya, one of Moscow’s uniquely designed metro stations. Eastern European cities have always held a mysterious reputation in my eyes, the obscurity increasing eastwards across the old Soviet Bloc. This impression was strengthened by previous city breaks. Prague is definitively different to Western Europe, but normal. Budapest intriguingly mixes old and new. Romanian cities are simultaneously wonderful and decrepit, and now I was on my way to Kiev and Moscow. 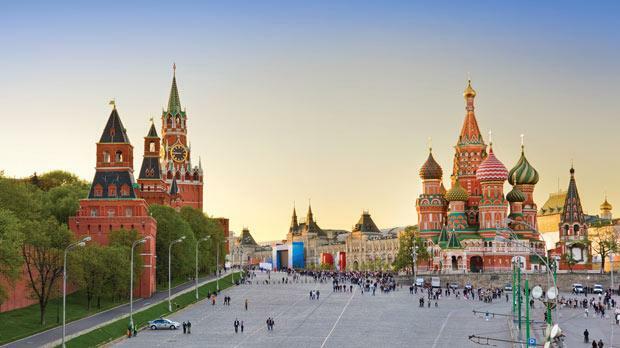 These two bastions of Soviet power were once at the centre of the so-called Second World. But I was to discover just how different they have now become. The Ukrainian countryside looks sad and lonely. On a long distance train, I pass dilapidated villages and fields tended by lone women with crooked backs. Grey clouds weigh heavy and the landscape appears to have its vibrancy snatched away. Kiev’s central station is subsequently a great surprise. 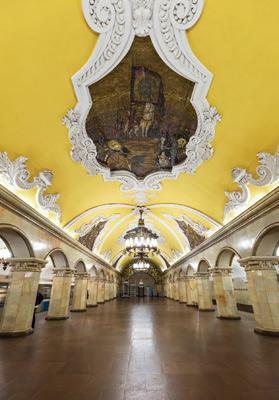 One side is extravagantly decorated with chandeliers, elaborate portraits and ornate sculptures. The other resembles a Sheik-funded airport, full of shining metal, straight lines and futuristic intent. Blasting over the PA system, a symphonic orchestra fills the space between apologies for delayed trains. Ukraine is no longer a communist country, but its State-run services are ludicrously cheap. A bus or underground journey costs 20 cents, museum entrance rarely exceeds €1, and alcoholism is a financial necessity. In most cafes, coffee costs six times the standard price for a half litre of frothy beer. At street kiosks, beer is half the price of water, and the stunning affordability of vodka makes it an opiate for the masses. The people look happy here, but I’m assuming they’re drunk. They walk through the city with smiles for strangers, exuding an air of positivity I hadn’t expected. Old mamas sell woollen socks at flea markets, young people cavort beside an 11th-century monastery and rows of designer shops dictate what’s hip in modern Ukraine. While much of the ancient city’s religious history was destroyed during communist years, St Sophia Cathedral’s green and gold facade boasts of Kiev’s riches. With five naves and 13 domes, it towers over the surrounding streets. Original mosaics still dominate the interior, shimmering gold and stretching 40 metres from floor to ceiling. St Sophia Cathedral is probably Kiev’s only stand-out attraction, but the grand central streets of its centre have an elegant and relaxing grandeur. Many of the wide boulevards have been pedestrianised, leading off from the Maidan Nezalezhnosti. This square was the centre point of celebrations for independence in 1991, and the peaceful Orange Revolution of 2004 that successfully overturned the results of a corrupt election. Dominating the square a golden bird stands above a huge white pillar, a hideous modern monument surely conceived by drunken architects. I’m told that it’s illegal to drink on the streets, but every bench is filled with locals swigging away; old bearded men in trench coats, young couples with beer cans, men in suits, and a fashionable woman with a hip flask. As I eat breakfast, the waitress looks confused at my drink order. On most tables around me a hearty shot of vodka is accompanying the morning meal. It seems to work for the city. Escalators in underground stations are usually torturous journeys through depressed gazes. At one station it takes five minutes to travel down to the platform, but everyone looks content, casually looking around with a glimmer ofa smile. Moscow welcomes me with an unsavoury stare. Police and military guard each street corner, blowing whistles and shouting at any mild indiscretion. Streets can only be crossed at pedestrian crossings, even though the red and green men are often kilometres apart. Entrance to McDonalds requires passing through a metal detector and I spend my time constantly looking over my shoulder. Alcohol is prohibitively expensive, but so are most things. While the streets suggest riches, the people walking around indicate poverty. But this is a city of wonder. Each underground metro station is uniquely designed, memories of when this was the artists’ capital of the world. Mosaic tiles cover floors, rich oil paintings adorn walls, stone archways curve elegantly, and it’s hard to imagine that you’re not inside a royal palace. These stations were a showcase, a chance to present the ideological wealth of the communist regime to the masses, on a daily basis. I spend an entire day exploring each different station, admiring the creativity. Some wow with artwork, others with graceful pillars, and then a battered metal train arrives to ruin theillusion. Back above ground a flurry of multi-coloured domes stand in front of me, the inimitable twirls of St Basil’s Cathedral marking the very centre of Moscow. It looks hideously wonderful, a religious building with the audacity to look like a series of ice cream cones. Blue and white, red and green, green and yellow; each dome vies for attention, pulling the gaze of every visitor to Moscow’s Red Square. This is the city’s cultural heart. Lenin’s mausoleum stands at one end, the monumental red walls of the Kremlin dominate one side, and two other cathedrals stand opposite St Basil’s. In this square you will find the good and bad of Moscow. There are few places in the world that can compete with the sheer concentration of opulent architecture. Each building is a unique attraction, but as a collection it more than compensates for the overbearing feeling of being in a nanny state when elsewhere in Moscow. On Red Square you can walk uninhibited, stopping for coffee and then eating pastries by the Minin-Pozharsky monument. The Prodigy and Paul McCartney have performed here, and the guards arerelatively thin on the ground. However, don’t forget where you are. An oblivious tourist asks a guard to take her picture. With an evil smile he throws the camera to the ground and stamps on it twice, before delivering a look that immediately squashes any protest. They don’t like foreigners and they ensure their feelings are communicated. In Kiev the police would probably put an arm around your shoulder and find a cafe for a vodka toast. In this scene the two cities are encapsulated and I’m glad my journey took in both. One is carefree, yet lacking must-see attractions. The other is iconic and beautiful, but marred by a heavy atmosphere. And both are compelling and puzzling in equal measure.